Topics: Overview, Leadership, Recognition + Awards, Development + Acquisitions, Development, and Acquisitions. 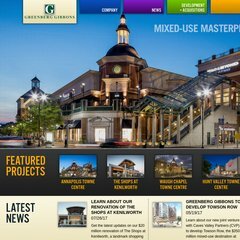 ggcommercial.com Located in Rapidly Growing Western Anne Arundel County, Maryland ..
ggcommercial.com Shopping Center, Retail Property, Towne Centre, Village Center .. The site has about 21 users daily, viewing on average 1.50 pages each. Its 2 nameservers are ns52.domaincontrol.com, and ns51.domaincontrol.com. Its IP Number is 69.161.223.2. It is hosted by American Registry For Internet Numbers (Virginia, Chantilly,) using Apache/2 web server. PING (69.161.223.2) 56(84) bytes of data.